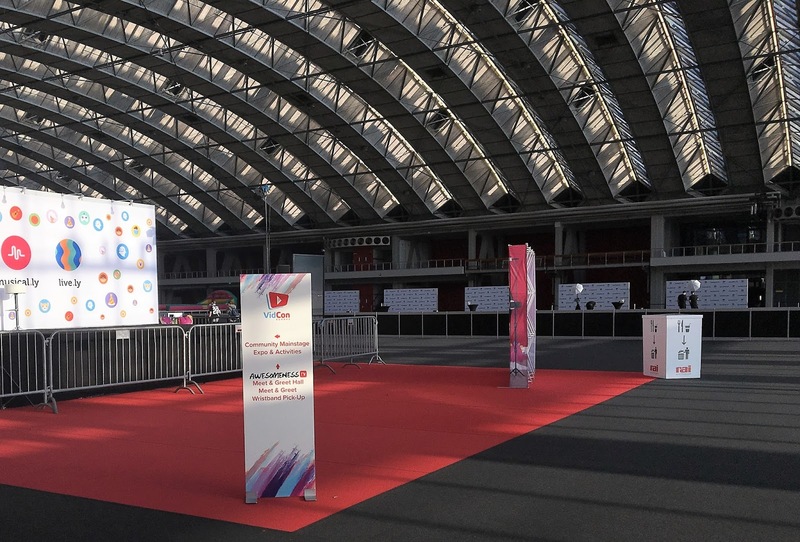 So as you may know, if you've read my Amsterdam Day 1 and Day 2 posts or if you follow me on social media, I went to VidCon Europe last month and it was incredible. If you want to know how those two days were, go make yourself a cup of tea or something and keep on reading; it's gonna be a long post. I've decided to write this post in like a chronological/diary way. Mainly because most things in Vidcon were scheduled (meet and greets, panels, etc...) so I 'planned' my days around those. Just in case you don't know what VidCon is let me explain it to you. 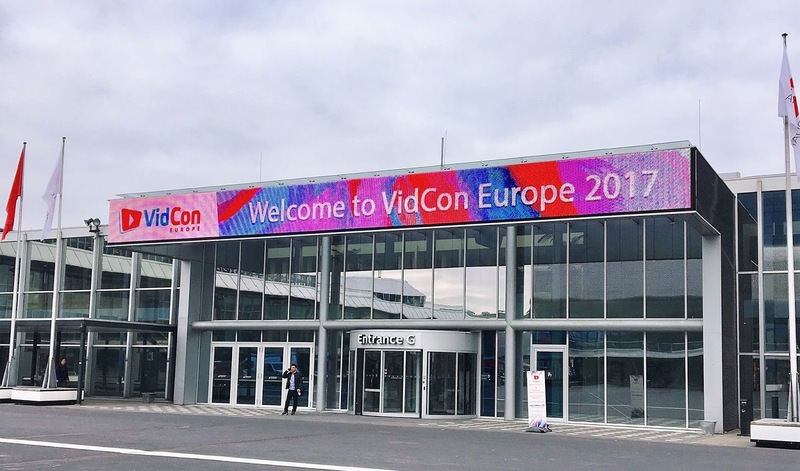 It's a convention created by John and Hank Green about online video and this was the first time it's taken place in Europe. There are 3 types of badges/tickets (community, creator, and industry) and depending on which you buy, you have access to different type of activities. For example, the Community pass is basically the one for 'fans' and with it, you have access to Meet&Greets, Q&As, panels, meet ups, etc. 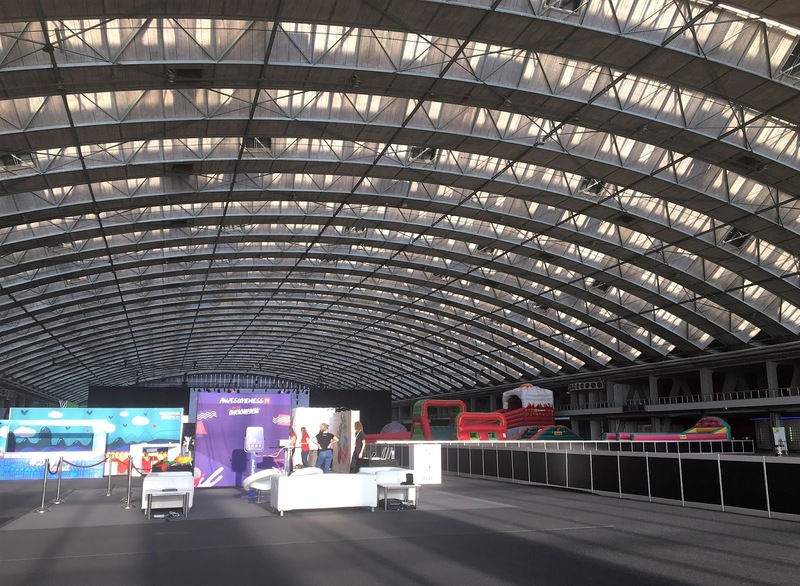 The Creator pass allows access to extra panels, workshops, creator chats with featured creators and also to the activities in the 'main' hall. The Industry pass is for professionals beyond content creation aka for those who work in talent management, software development, etc. Most of the things the Community badge allowed me access to where in what was called 'HALL 1' and it was a HUGE room with different areas: the M&G area; some exhibitor booths such as musica.ly (tbh I still don't know why this was there but whatever), merch stand, Taco Bell, Vidcon Booth, etc. ; an inflatable park; a chill lounge; the Community Mainstage (where panels, Q&As and the Night Shows took place) and some food places. There was also an auditorium in another part of the building where some of the panels took place. 9am: queue for the first meet (Sarah Close). 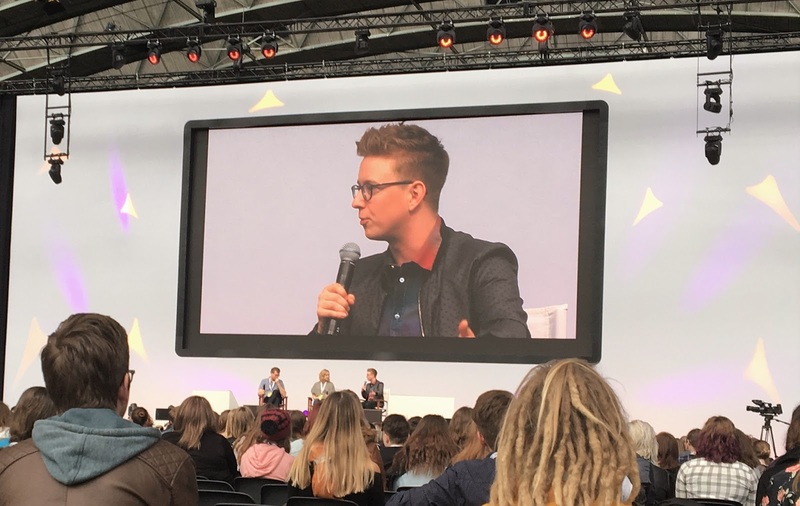 Whilst I was waiting Tyler Oakley was doing a panel in the mainstage and I basically just heard bits about it and saw him on the big screen. 9.30am: M&G with Sarah. She wasn't in my top picks (we had to choose 10 creators and then there was a lottery and we got 4 meets out of those) but I was excited about it anyway. I talked with her for a few minutes about her music, traveling (because I told her I was from Barcelona), she signed my badge and we took a few selfies. 9.50am-10.30am: I went to see the panel Tyler Oakley was in, I only missed the first 20min. The moderator was Kati Morton and besides Tyler, it also featured John Green. Now, I didn't know who Kati was before Vidcon but I highly recommend you to check out her channel if you're interested in mental health or struggle with any mental health illness, she's a therapist so she does know what she talks about and the videos are so helpful and educational. The panel was called 'The Power of Community' so they talked about the relationship between creators and viewers, the values, identities, and traits of the community. 10.30am-12.30pm: I think I just walked around the place and checked out the different booths. Then when I was alone again, I casually met Niki and Sammy, I had no idea they were at Vidcon so I was VERY surprised. I joined a few girls that were talking with Sammy and we talked with him for a bit and he even asked us to be in his vlog!! After taking selfies talking a bit more and all that he had to leave so I went up to Niki before he had to leave as well, I briefly talked with him but couldn't get a picture, I don't care though because I rather have a real conversation with someone than have a picture tbh. 12:30-1:30pm: at this point, I was exhausted so I went to the panel area again and sat there. I saw Sarah doing her soundcheck (she performed at the night show) and the Smosh Q&A. I don't really watch Smosh but I have to admit I had a lot of fun, some of the viewers' questions were pretty funny and they are funny guys too. 1.30-2pm: Evan Edinger's impromptu meetup. He was in one of the booths and I joined the people there. We talked for a while and took selfies and all that. 2-4.30pm: queuing for Jon Cozart's meet. It was so boring because my anxious self was so scared to start a conversation with the people around me. Dodie was to my left doing her meet and greet so I basically just enjoyed watching people meeting her (sort of wishing it was me too since she was my 2nd meet option and I didn't 'get' her). Then when I was away from meeting Jon, they told us to be quick and don't take a lot of time since it was already so late. So I panicked. I went up to him and hugged him. He told me he loved my sweater and I said thanks and told him I came from Barcelona and I think I only asked him how was he and if he was having fun. Then we got our picture professionally taken and he hugged me again and said goodbye to him. I forgot to ask him to sign my cast but he was so nice and cute and smol. 4.30-5pm: queue for Nika Erculj's meet. When I arrived there was only one girl in front of me and we talked a bit. Also, Emma Blackery was right there in front of us with the last few people from her meet and I just looked at her and she talked to us this one time and I can't remember what I said but she kept smiling at us. 5-6.30pm: Nika's meet. 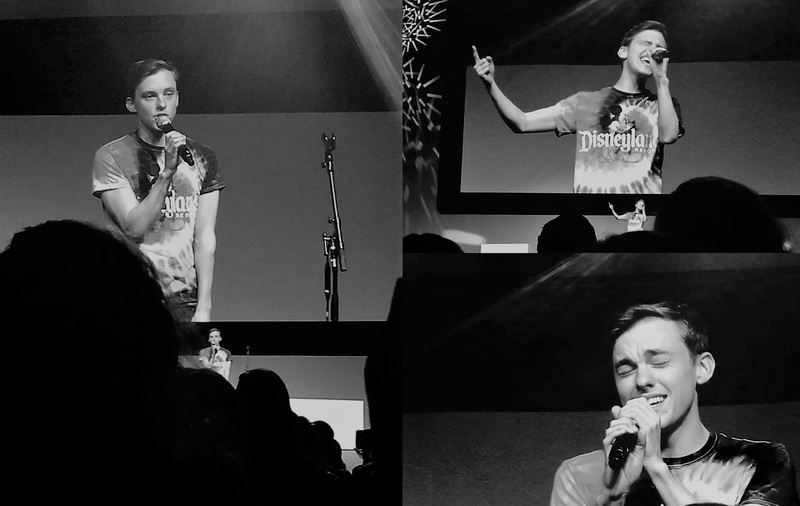 Probably one of my favourite parts of the whole Vidcon experience. Only 5-6 people turned up at the meet and I felt so bad for her but she was like don't worry you guys, I didn't expect anyone to come so it's alright. We basically just sat on the floor and talk about EVERYTHING: mental health, video content, traveling, life, books, tv shows, languages (I taught her how we say I love you in Catalan, because she said she likes to learn that in different languages), also about Vidcon and how differently we live it compared to a creator and many other things. Honestly, it felt like I was talking to a friend. Like she said, it feels A LOT more human to have experiences like this one rather than queuing up to meet someone and only have 2-3 minutes to talk with them. 6.30-7.30pm: I went to the main stage, found a seat and waited for the 'Saturday Night Featured Creator Show' to start. I also ate something because I was SO hungry. 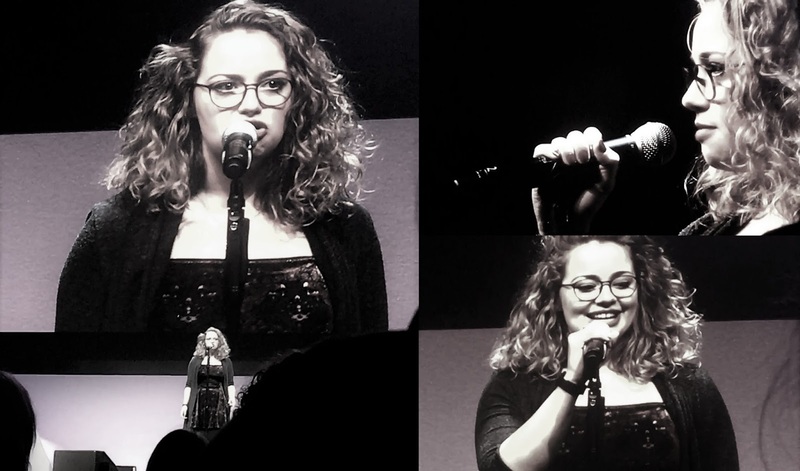 I was super excited about the show because Carrie Hope Fletcher was performing and tbh I went to Vidcon mainly to see her. Only thing is that I expected her to do a meetup or a panel for community passes or something but she only performed in the show and did 1-2 creator chats for people with creator passes. 7.30-9.30pm: Hannah Witton and Reid Reimers were the hosts. Through the evening many creators performed. Some talked about their experiences; most were related to mental health issues and I swear to got I had to try so hard not to shed a tear because having been alone pretty much all day was extremely exhausting (mentally) for me. Some shared poems. Some shared 'exclusive' content from future videos/projects. And some played their music. I almost cried watching Carrie perform. Look, I was so sad when I went to London and couldn't see her play in Les Mis so seeing her there in front of me didn't feel real, at all. I've been watching her since she only did covers so yeah, I was over the moon to see her. Wish I could've met her but oh well. I only filmed Carrie but I'm gonna list everyone that participated on the show in case you want to check them out: Kati Morton (talked about mental health), John and Hank Green (talked about VidCon), Scola Dondo (talked about body image and being good enough), Jack Howard and Dean Dobbs (played an episode of their show), MatPat (he gave an inspiring speech about anxiety and fear), Nathan Zed (I really can't remember what he said/did but I know I loved it), Savannah Brown ('couldn't care more' poem). I think there were more but I can't remember them, sorry. Even if I was on the verge to tears quite a few times, I deeply enjoyed being there and not only seeing people that I love but also discovering new wonderful and inspiring people. I also had an 'OMG I'm in Amsterdam and all these people I usually see through a screen are right in front of me WTF is this even real' kind of moment. 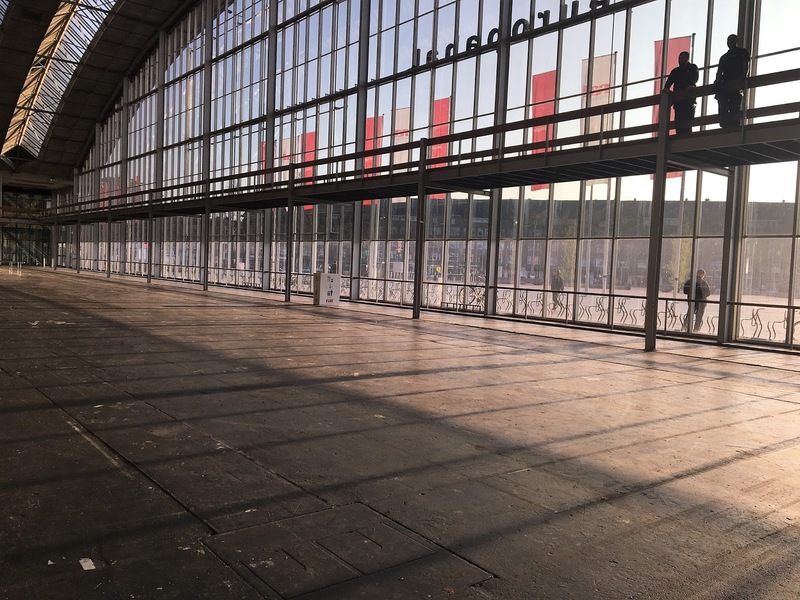 8.15-9.30am: wandering around HALL 1 (almost empty). 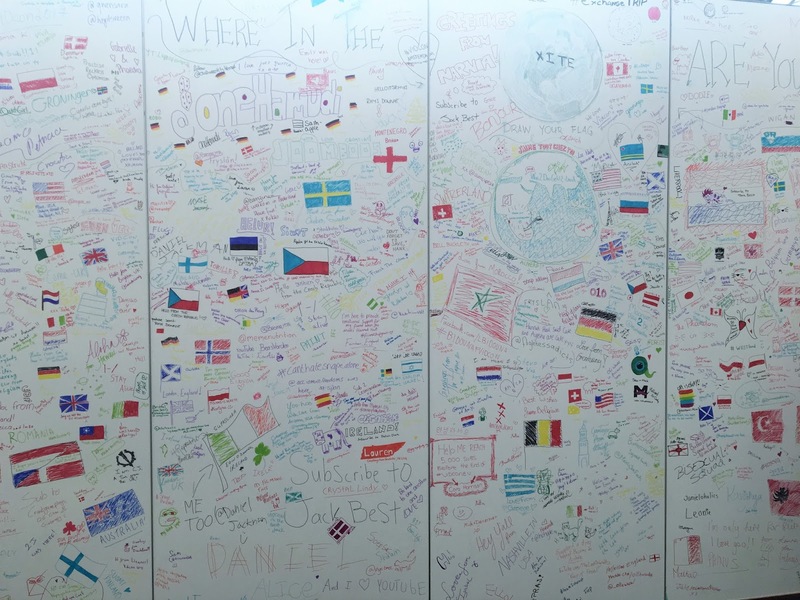 Both my friend and I wrote on the 'Vidcon wall'. Then we went to the auditorium and waited for a panel to start. 9.30-10.30am: 'A conversation about mental health' panel with Kati Morton, Nika Erculj, Thomas Ridgewell (Tomska) and Beckie Jane Brown. This was one of my favourite panels. Again, I almost cried at one point. They talked about A LOT of things regarding mental illnesses and how to cope with them and also shared some personal experiences and advice. It was very interesting and I wish it could've lasted more. 10.30-11am: I said goodbye to my friend because I had to return to HALL 1 for my meet at 12am. 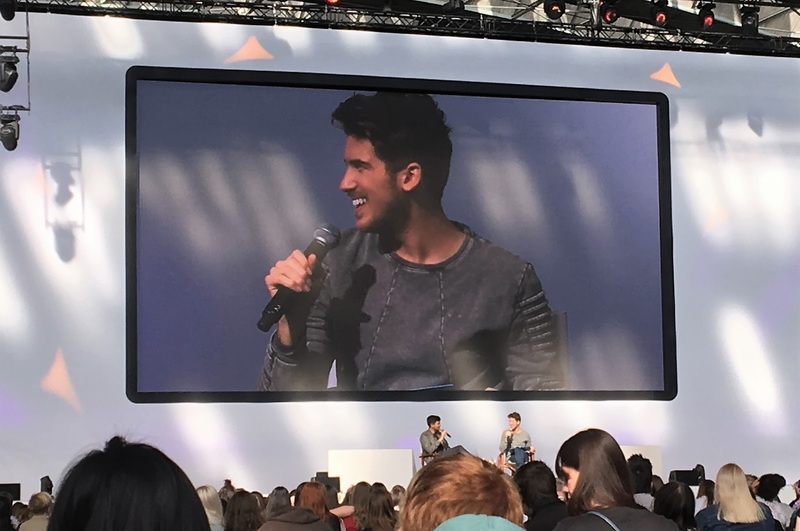 Since I couldn't start queueing for my meet until 11, I decided to check out what they were doing on the main stage and Joey Graceffa was doing a Q&A so I sat in the back and listened. 11am-12pm: queue for the meet with Niomi Smart. I was the 5th person in the queue and everyone seemed lovely but they were all talking in Dutch and even if I knew they probably knew English very well, I was scared to interrupt them and 'force' them to talk in English if that makes any sense. Anyway, then Niomi and the other people that were doing meets at that time arrived and she filmed us waving (it didn't appear on her vlog though). I talked with her for a while and she was SO lovely, she told me it was incredible that I came from Barcelona (yes I told that to everyone) and asked me if I was having a good time. I also told her she inspires me so much and I can't remember anything else, I also forgot to ask her to sign my badge but whatever. 12-3pm: I wandered around all the booths again and saw a few creators but I don't watch their videos so it didn't feel right to go up to them and say hi. 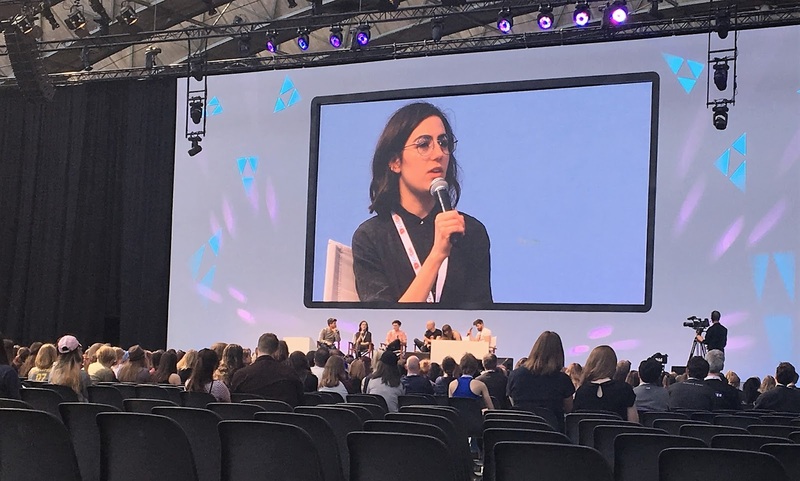 Then I also went to the 'chill lounge' for a while and then I bought myself an ice cream and went to the main stage to see a panel I wasn't really interested in but Dodie was in it so. During that panel, Tyler Oakley walked past that area (but on the upper floor, idk how to explain, watch his vlog and you'll understand) to go to his meet and he basically just waved at everyone but I was alone, far back in the audience and I looked up to see him and he smiled and waved and I literally died. 3-3.45pm: I went to the entrance mainly to steal wifi from the restaurant. And I'm so glad I did that because not long after, Dodie said she'd do a meetup in a room right next to where I was at. You can all imagine how excited I was, her 'official' meetup was the day before so I thought I had no chances of meeting her! I gave her a watercolour painting I did of her and she told me it was the first time someone had painted her with her tattoo so I was like fangirling real hard inside. Then I also told her I was from Barcelona and she was like 'Barcelooona uh that's nice' and asked if I was having fun and all that and then we took a selfie and the lighting was great and it's the best selfie I have from VidCon. 3.45-5pm: I went back to where I was before the meetup and I found my friend and her friend there so we just hang out together there and then at the Taco Bell booth (because they printed whatever picture you wanted in a polaroid 'style' if you tweeted them with a hashtag). Then both of them had to leave to queue for their meet and greets and I was left alone again. 5pm-6.30pm: I went to the main stage again and watched a Q&A. It was Rhett and Link and I had no idea who they were but they were SO funny, I loved it. 6.30-7.30pm: All the activities were over and the booths were closed so I decided to try and get a good seat for the night show and just wait. I was so bored and I caved in and decided to use phone data (surprisingly they didn't charge me a lot). I talked with my sister until the show was about to start. 7.30-9.30pm: It was time for the 'Sunday Night Featured Creator Show'. A lot more uplifting that the one from Saturday. The hosts were Jack Howard and Dean Dobbs so you know, fun guaranteed. 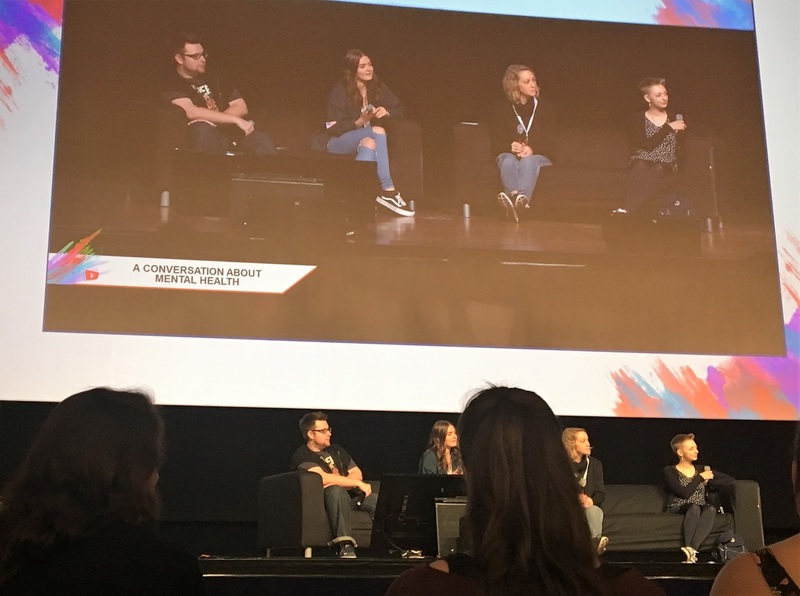 Creators did a lot of challenges on stage like 'trying food from a different country', played games, showed exclusive content (we watched this Youtubers React video and it was hilarious, I love the react videos) and again, there were also performances. Dodie and Jon Cozart played and I was over the moon. 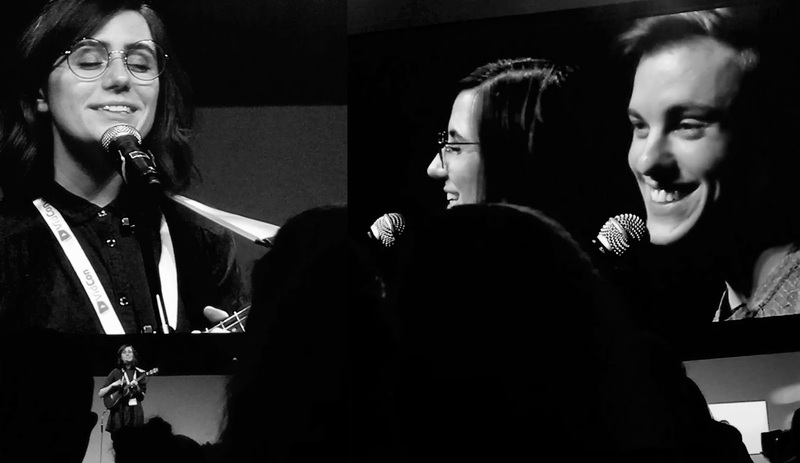 Dodie sang When, Would You Be So Kind, You (new song) and An Awkward Duet with Jon and please let me tell you, they are the cutest interacting with each other, it was cute and funny. Then Jon sang the After Ever After song (the first one) and I love that song so it was perfect, 'Tourist: A love song from Paris' with Dodie and the Youtube Culture parody song which may I say, it was hilarious that he did THAT at Vidcon. Overall, VidCon was an amazing experience. I had my ups and downs throughout both days but what can you do. The only complaint I have is that there were a lot of interesting panels taking places at the same time I had meet and greets and I know that also happened to lots of other people which is sad. They should organise this better next time. But, if you have the chance and your favourite creators go to Vidcon, definitely go. It may be expensive to travel abroad but I definitely would do it again. Have you ever attended a convention like Vidcon or met any youtube creators? AAH yay you're the first person I know that knows who she is hahah but yes what you said is completely true, she is exactly like she is in her videos and having a proper chat with her was the absolute best.